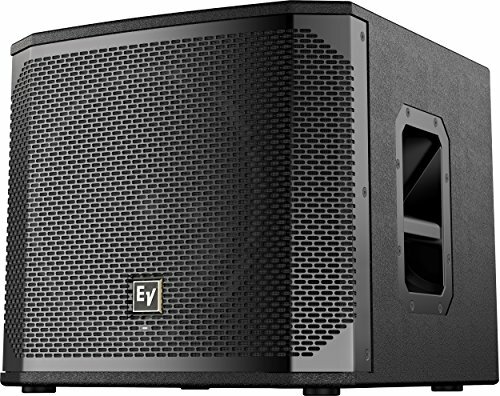 ELX200-12SP features high-efficiency Class-D power amplifiers (up to 1200 W) with integrated QuickSmartDSP, and delivers up to 129 dB SPL utilizing transducers designed and engineered by EV (12-inch EVS-12L woofer). Powered subwoofer models allow easy setup via three presets (Music, Live, Club), sub/top system-match crossovers, three-band EQ, five user-programmable presets (Store and Recall settings), visual monitoring of limiter status, input level control and meters, and master volume control to ensure optimal gain structure. ELX200 powered models are ideal for portable and installed applications, with lightweight and compact 15-mm wood enclosures, integrated M20 threaded pole pole mount plate, and two-handle design for easy lifting. The new QuickSmart Mobile wireless control and monitoring application, using Bluetooth Low Energy (BTLE) technology, allows intuitive system control, configuration and monitoring of up to six powered ELX200 loudspeakers simultaneously. Receive alerts when your system is being overdriven, and control your system while in front of your speakers, not behind. Bluetooth is available in select countries.